The Balanced Scorecard (BSC) is a planning and management system that is widely used in a variety of areas in the private and public sector, with the aim of ensuring that the activities of an organisation are in line with its vision and strategy, improving internal and external communications, and monitoring organization performance against strategic goals. 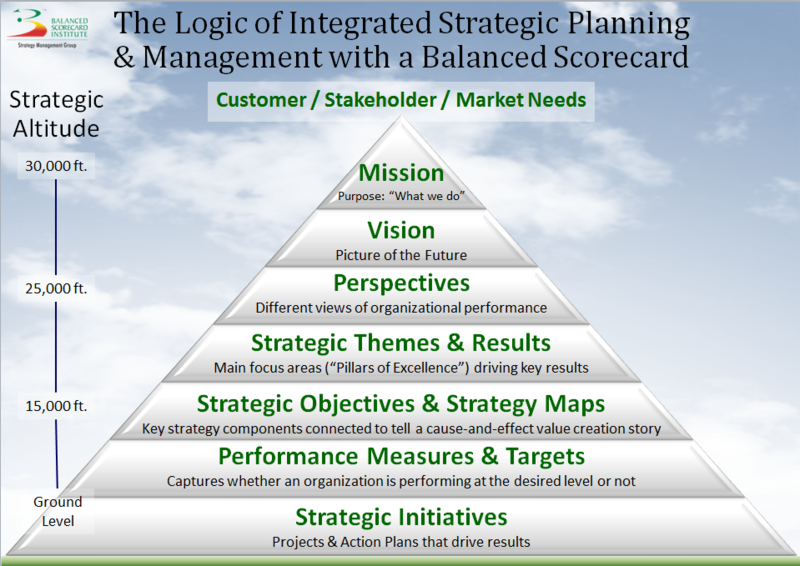 The idea behind the original balanced scorecard was that it provided a performance measurement framework that added “strategic non-financial performance measures to traditional financial metrics to give managers and executives a more ‘balanced’ view of organisational performance” (Balanced Scorecard Institute, n.d.- a). The value of the BSC is that it transforms a strategy into a continuous process owned by every employee, not just top managers, and enables organizations to communicate high-level goals down through all levels such that employees not only know what to do, but also why they are doing it (Kaplan & Norton, 2004). 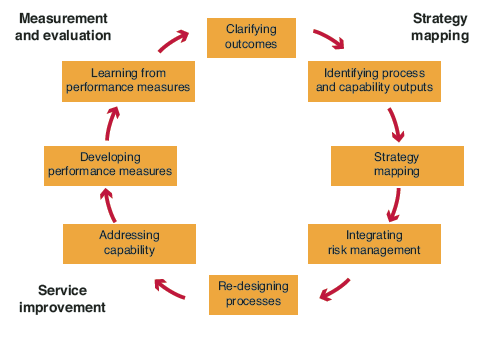 This method would be useful to RIS3, as it would allow the effects of specific strategies to be traced, determine how they are helpful or where they are lacking by implementing measurements to strategy objectives, based on the views of the stakeholders involved and customers affected, and improve on them in the future, in order to achieve a broader improvement in performance taking into account a wider framework that does not include financial performance. However, it should be noted that there is a difference in approach between a private versus public balance scorecard (see “Description of the method”). Furthermore, there is also the Public Sector Scorecard (PSS), which has been developed from the due to the argument that the BSC still fails to measure important outcomes in the public and third sector organisations. The mapping exercise showed that around 23% of selected regions have employed some elements of balanced scorecard in RIS3 monitoring and evaluation process. Among the most elaborate approaches would be Lower Austria, where the tailored balanced scorecard methodology ARISE was employed. 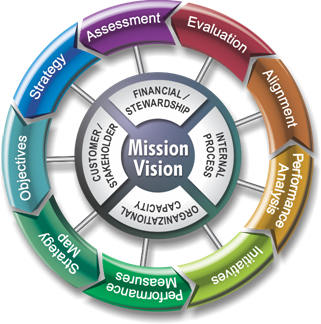 A way of aligning organization vision with human and capital resources, and with day-to-day operations. 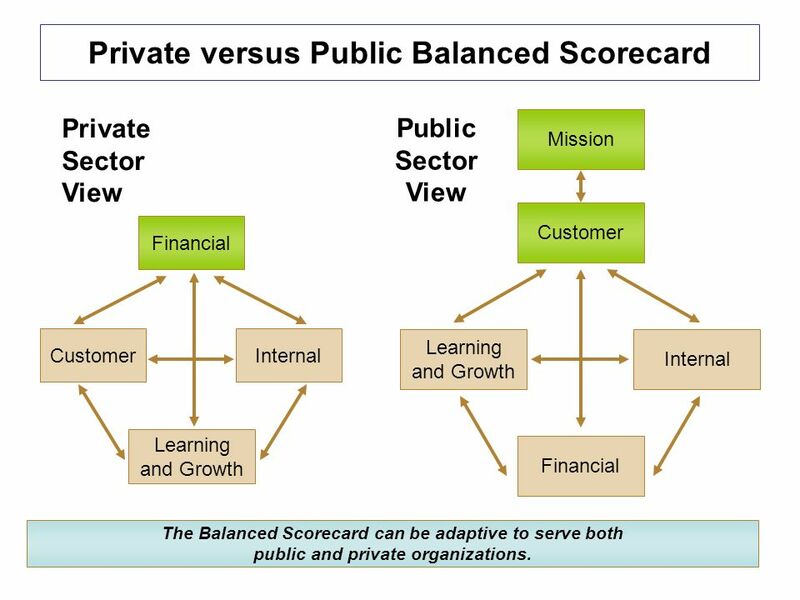 This is presented in a four box model (see graphic “Private Sector View” in Figure “Private versus Public Sector Scorecard”). As mentioned under “Background and rationale” BSC has developed throughout the years and the four box model now includes also a Strategy Map (see Figure 19), which is at the heart of modern Balanced Scorecard (The Advanced Performance Institute (API), n.d.). A Strategy Map are communication tools to show how is created for an organization. 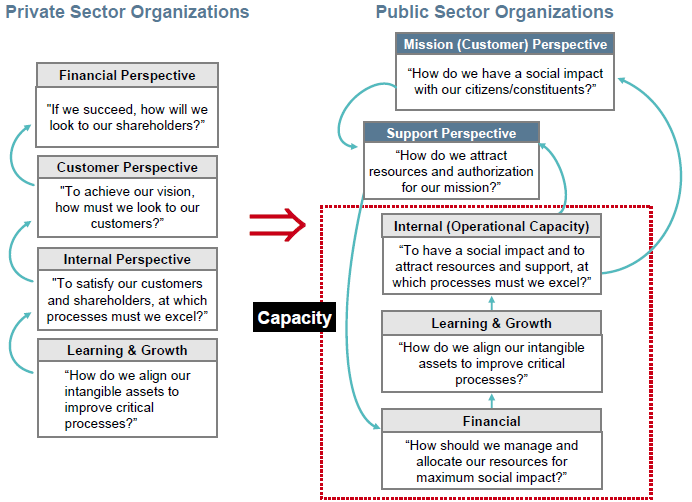 Strategy maps show a logical, step-by-step connection between strategic objectives (shown as ovals on the map) in the form of a cause-and-effect chain (Balanced Scorecard Institute, n.d.- a). With respect to the values of the four perspectives in the BSC, the financial perspective ranks higher despite supplementing these with metrics from three additional perspectives (Kaplan R. S., 2010) as “[t]imely and accurate funding data will always be a priority” (Balanced Scorecard Institute, n.d.- a). However, this creates an issue for public and non-profit organisations as the BSC values financial metric data higher in organisation where success cannot be measured in financial terms. Although Kaplan does recognize that the BSC has its short comings when applied to public sector organizations (PSOs) – “The financial perspective provides a clear long-run objective for profit seeking corporations; however, it serves as a constraint, not an objective, for PSOs.” (Kaplan R. S., 1999). He recognizes that the success of PSOs should be measured according to how effectively and efficiently they meet the needs of their constituencies. Hence, the BSC has to be adapted accordingly (see Figure 20 below). As we can see in the graph Figure 21 below capacity encompasses three perspectives: Internal, Learning & Growth and Financial. Note that the Financial Perspective is at the bottom of the value chain. How to improve outcomes for service users and other key stakeholders without increasing overall cost? How to develop performance measures that ensure quality without motivating staff to achieve arbitrary targets at the expense of poor service? At the core of the PSS is that it focuses on effective performance management through collaboration, inclusion of frontline staff, end users and other stakeholders in establishing metrics that are constructive. Outcomes should be measured according to a variety of interested parties, and also be adjusted accordingly (Robinson, 2015). Whether one uses the balanced scorecard (BSC) or the Public Sector Scorecard (PSS), either offers a comprehensive picture of strategy, taking into account all its components. They offer a balanced view between outcomes and enablers of a strategy. Public sector organisations are increasingly under pressure to ensure that public money is allocated intelligently. They must be able to measure and report whether strategic objectives are being met, and whether stakeholders and customers support these objectives. It is about aligning aims, outcomes, outputs and enablers (or capacity). It is not merely about one step in the process, but the whole process, from start to finish. This is very valuable in the development and implementation of a successful smart specialisation strategy. What is the aim of the S3 strategy? Is the aim shared by stakeholders and customers? Is there capacity to achieve the aim? Once the strategy has been laid out, the scorecard offers a tool to continuously monitor and evaluate the process and feed it back into the strategy to make adjustments if necessary, creating a loop for learning. It allows the effects of actions to be traced efficiently and any negative actions to be rectified through the adjustment of goals. The method would require the stakeholder to be able to evaluate the goals that had been set and implemented in the region. It would require stakeholder input in order to analyse the customer perspective, economic data to analyse the financial perspective, data on businesses for the business process perspective, and lastly data on the internal working of businesses or employee input in order to manage the analysis of the learning and growth perspective. Public Sector Scorecard stresses the importance of involving stakeholders in the process – “the benefits of involving stakeholders – not just in judging performance but in devising how performance should be judged in the first place” (Robinson, 2015). See also references used under this method. it affects the ability to learn and grow. What are the critical success factors in each of the perspectives in the value chain (perspectives)? What are the key measurements that will signal that the organisation is addressing the success factors as planned? Taking the BSC from a public and non-profit sector perspective, Kaplan (1999) states that the “start of any performance management exercise must be to reaffirm or focus the organization’s strategy: to define what it is uniquely qualified to do and to reject possibilities that will not deliver on the organization’s mission and purpose”. Furthermore, a well-articulated, focused strategy will help evaluation with the BSC. The first thing public and non-profit organisations should do is to start by identifying an overarching objective for their mission at the top of their scorecard. Kaplan (1999) mentions that the financial and customer perspective of the BSC can be combined to provide a framework in which a government organisation has three high level themes: Cost Incurred, Value Created, and Legitimizing Support. After the top-level scorecard has been created, the next step for public and non-profit organizations, similarly to private-sector organizations, is to deploy the process down through to its individual departments. The departmental scorecards must reflect the themes and objectives established in the top-level scorecard. 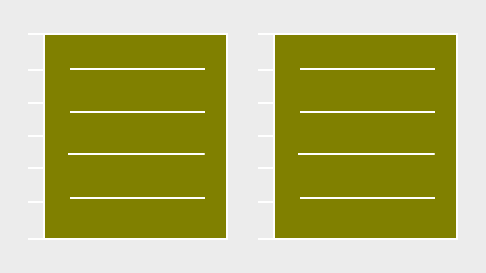 The local scorecards describe how each department does its job to contribute to the top-level organizational objectives. 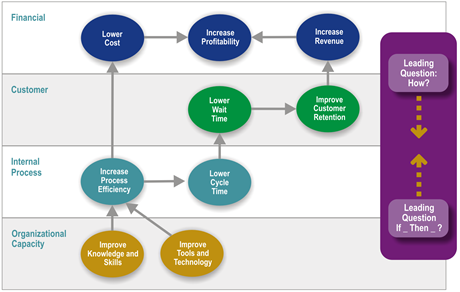 – Strategy mapping, Service improvement, and Measurement and Evaluation (see figure). Phase one – Strategy mapping: is the key output of the PSS, showing the relationships between outcomes and process and capability outputs. The phase is centred around a number of interactive workshops attended by a wide range of stakeholders that work together to discuss desired outcomes – strategic, financial, user-centric, etc. and the processes and capabilities needed to achieve them. Phase two – Service improvement: the strategy map is used as a quick way to appraise the effectiveness of different processes in satisfying the desired outcomes. This phase should become more factual by using available evidence or data, supplemented where appropriate by tools such as process maps, systems thinking and lean management. Phase three- Measurement and evaluation: here possible performance measures for each element of the strategy map should be considered, which should be selected on the basis that they provide value, are cost effective and minimise any perverse effects. According to Moullin (Robinson, 2015) “Performance measures don’t have to be strictly quantitative … In many cases – especially in some capability areas – more qualitative approaches are preferable”. What is important is that an evaluation strategy should be developed in an early stage project group, task force, etc., as it helps to form the strategies and processes to meet the desired goals.